Rich wood paired with plush cushions dressed in your favorite fabric makes the Amish Balboa Sofa a favorite place to be. The frame of this sofa sets it apart from the rest with wide armrests, a thick bridge and wide slats on the sides. Every inch of the solid wood reveals unique grain pattern, a characteristic of authentic solid wood furniture. Balboa combines comfort and style that will serve your family for decades. 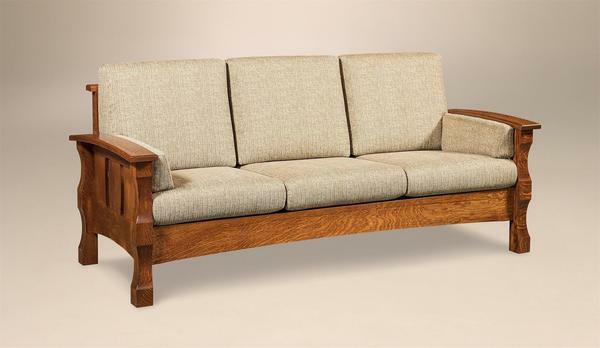 The Amish Balboa Sofa is shown here in quarter sawn white oak wood with Micahel's cherry finish and Davey fabric. You're not just picking a sofa like everyone else's at DutchCrafters. We're proud to match custom furniture to your particular needs and styles. Our Amish Furniture Specialists can be reached by email or phone if you have any questions. Thank you for shopping with DutchCrafters. The sofa is shown in quarter sawn white oak wood with a Michael's cherry finish and the 25-19 Davey fabric.